School children from across Sefton have been learning about local health services as well as giving their views on the NHS. Your Youth Health Day on Thursday 19 July saw pupils from Maricourt Catholic High School in Maghull and Southport’s Stanley High School work with Sefton Young Advisors, to learn which local NHS service is best for them if they are unwell or want some advice on their health and wellbeing. The event was organised by NHS South Sefton Clinical Commissioning Group (CCG) and NHS Southport and Formby CCGs’ joint Engagement and Patient Experience Group (EPEG) which brings together representatives from organisations including Sefton Council, Healthwatch Sefton and Sefton Council for Voluntary Service (CVS) to look at how the CCGs can better involve residents and partners in their work. Health commissioners were joined at the Formby event by staff from Sefton council to hear young people’s views about health care. The event saw pupils taken through everyday scenarios, how to lead a healthier lifestyle, and which NHS service to consider for a range of medical issues, ranging from when to get advice from local pharmacists and the NHS111 phone service for minor conditions, to when to call 999. Ryan McCarthy from Sefton Young Advisors, said: “This event is about getting young people introduced to the health services they might have accessed or access in the future, looking at their knowledge and hopefully improve it by looking health scenarios which may affect them in the future. This has been the second dedicated young person’s event organside by EPEG, led by Sefton Young Advisers and part of the CCGs’ commitment to ensuring the ‘voice of the child’ is recognised in health services. 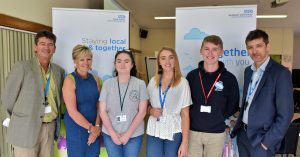 Graham Bayliss, lay representative for patient and public engagement at NHS South Sefton CCG, said: “The NHS is all about listening to all its patients, but the voices of young people can sometimes get drowned out by adults. Gill Brown, governing body lead for patient and public participation for NHS Southport and Formby CCG, said: “They’ve really changed my views about how we communicate with young people, especially around social media. To find out more about getting involved in the work of your local NHS, please email communications@sefton.nhs.uk or call 0151 317 8456.